Al Murray holds a pint up. Complete with one of his jokes. 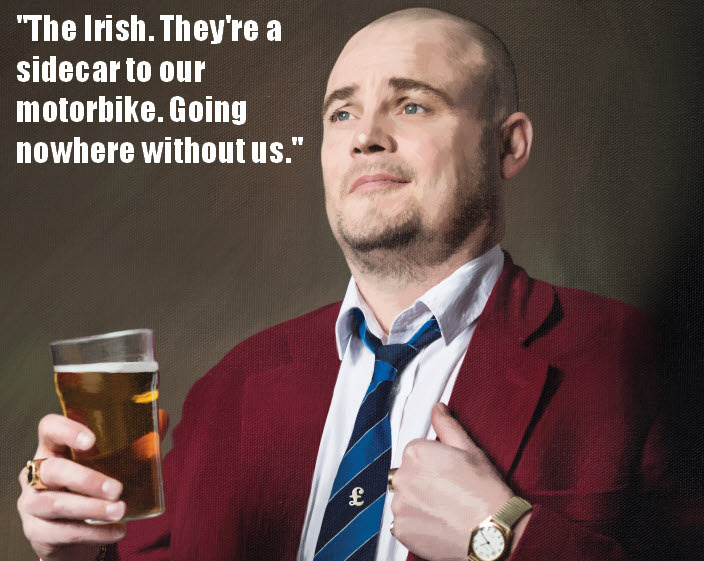 Al Murray is best known for his stand-up character the Pub Landlord, a blunt, xenophobic licensee with distaste for anything not British (especially Germans, Scots and the French). First created in the mid-90s, the character is still hilarious. He is well known for catchphrases such as ‘A glass of white wine/fruit-based drink for the lady‘, and for his booming, gurning, lecherous persona who dislikes students. He has released several popular DVDs including My Gaff, My Rules. To celebrate the big guy here are some of his funniest lines. If we had no rules where would we be? France! If we had too many rules where would we be? Germany! We shouldn’t insult the French of course, because they’re not here to defend themselves. And we know how good they are at that. Is your dad proud of you, son? He’s never said so, has he? George Bush should be the man the Americans send to Mars. On the Swiss: They’re like a flat that will never sell because the Austrians, Germans, French and Italians are neighbours. On the Irish: They’re a sidecar to our motorbike, they’re going nowhere without us. Rugby, posh man’s sport of course, fifteen men on a team, because posh people can afford to have more friends. We do not go in for philosophy in this country. We have our own system. It’s called wondering. The Taliban were bang out of order. If the dishes are done, there’s no need for a mask. Murray sometimes tells audience members what their names mean in Anglo-Saxon. One American woman named Bridget was told her name translated into ‘unwelcome cousin’. Murray’s comedy has garnered several awards, including Edinburgh’s coveted Perrier prize, while his theatre show with the pub landlord, My Gaff, My Rules, was short-listed for a Laurence Olivier Award. A Glass of White Wine for the Lady, another stage tour, ran to critical acclaim, and his chat show Al Murray’s Happy Hour on ITV won a British Comedy Award and was nominated for a National Television Award. Al Murray returns to the Edinburgh Festival this summer (201) with what will no doubt be yet another sell-out show at the Pleasance Theatre, before touring the UK later in the year. There are several DVDs available including Time Gentlemen Please, Giving it Both Barrels and My Gaff My Rules are all available online now. Any comments on the proud Englishman can be left in the comments section below.